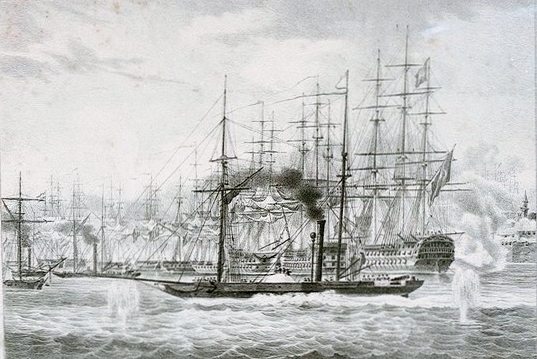 Though steam propulsion was first applied to warships, on a small scale, in the late 1830s, it was to take another half-century before sail was finally abandoned by the world’s navies. The process was paralleled with the replacement of wood by metal – initially iron and later steel – for construction. 1840 was however to see the last major action by the Royal Navy in which a sailing wooden line-of-battle ship, of a type almost identical to those which fought under Nelson at Trafalgar in 1805, was to play the leading role. It was however supported by small steamers. The scene was to be Sidon the coast of Lebanon, then regarded as part of the Ottoman province of Syria, in 1840. Present conflicts in the Middle East are only the latest in a long series of struggles for power which go back to the dawn of history. In the last two centuries however these clashes have arisen from the weakening and eventual demise of the Ottoman Empire – a development which still has massive influence on events today. In the early nineteenth century the Ottoman Sultan in Istanbul ruled, in theory at least, a vast empire that stretched from Libya in the west to the Arabian Gulf in the east, and from what is now Romania and Serbia in the north to the Sudan in the south. A weak central government, all too often bedevilled by corruption and by difficulties in communication over such a vast area, made it easy for local governors to set themselves up as semi-independent rulers. The most notable of these ambitious local governors was Muhammad Ali (1769 – 1849), an Albanian general in the Ottoman Army who was appointed governor of Egypt in 1805. His first step in consolidating his power was to eliminate the Mamluks, the warrior caste which had ruled Egypt, under the Sultan, for over 600 years. 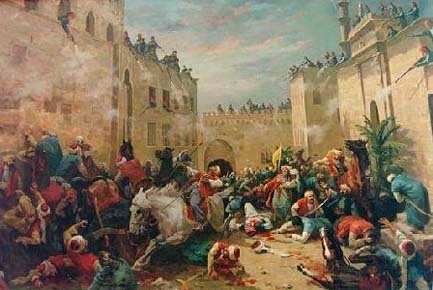 He did so in 1811 by inviting the Mamluk leaders to a celebration at the Cairo Citadel. Once gathered there, they were surrounded by Muhammad Ali’s troops and slaughtered. He was now de-facto ruler of Egypt and the Sudan by the 1820s was arguably as powerful as the Sultan himself . Muhammad Ali’s only setback in this period stemmed from Intervention in the Greek War of Liberation, which began in 1821. The Sultan’s army proved incapable of putting down the revolt and Muhammad Ali was offered the island of Crete in exchange for his support. 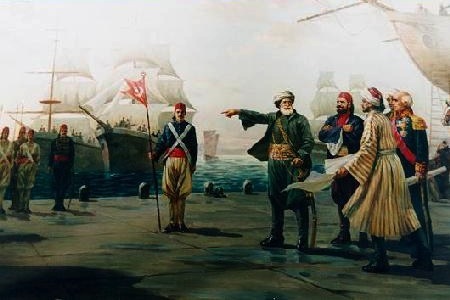 Over 16,000 Egyptian soldiers, supported by the modern fleet that was being built up in Egypt, went to Greece under the command of Muhammad Ali’s son, Ibrahim Pasha. 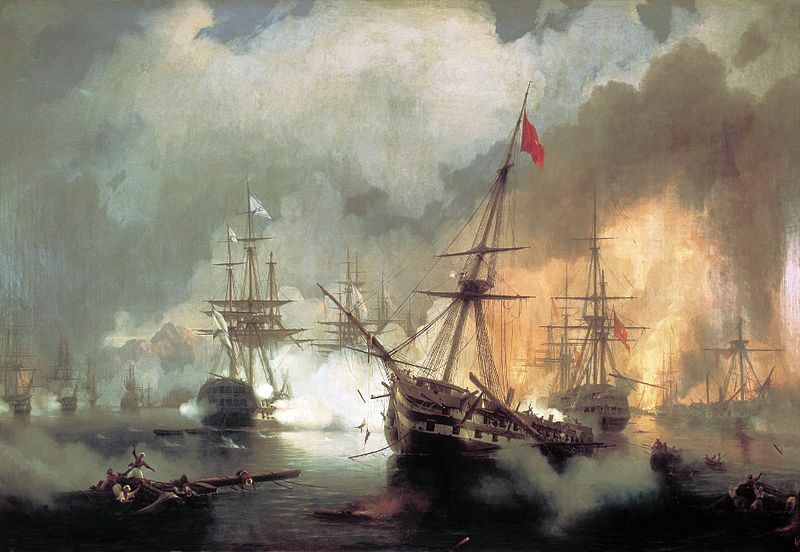 This led to intervention on behalf of the Greeks by Britain, France and Russia, culminating in the battle of Navarino in 1827 in which the entire Egyptian navy was sunk by an allied fleet, under the command of Admiral Edward Codrington (1770–1851). This was the last major fleet action under sail and, most appropriately, Codrington had been one of Nelson’s “Band of Brothers”. 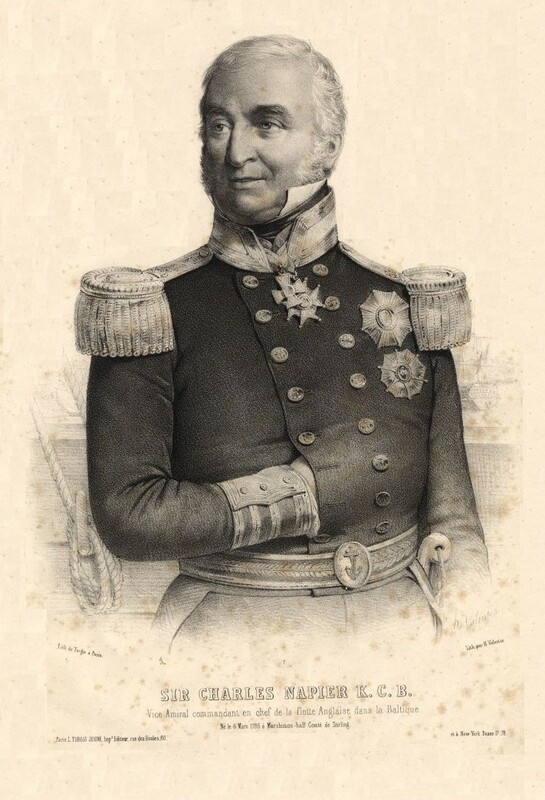 He had joined the Royal Navy in 1783 and had been present at the battles of the Glorious First of June (1796) and Trafalgar (1805), commanding HMS Orion at the latter. In compensation for the loss of his fleet Muhammad Ali asked the Sultan for Syria – a term which then included modern Lebanon and Israel in addition to the country now known as Syria. 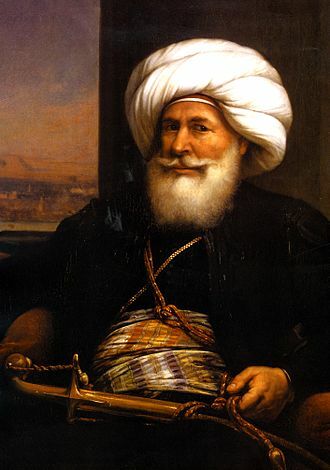 The Sultan refused and in the early 1830s Muhammad Ali, successfully seized Syria, and much of Arabia, in a campaign that was notable for Ottoman ineptitude. A mixture of medieval despot and enthusiast for modernisation, Muhammad Ali now concentrated on building a powerful and independent European-style state. No opposition was allowed and the process was often brutal. He set out to streamline the economy, train a professional bureaucracy, and build a modern military machine. He not only encouraged agriculture – the global demand for cotton was insatiable – and he built an industrial base, primarily focused on weapons production. By the end of the 1830s, Egypt’s war industries had constructed nine 100-gun warships and were turning out 1,600 muskets a month. In 1839, the Ottoman Empire, now ruled by the young Sultan Abdülmecid, attempted to retake Syria. Ottoman ground forces were once again routed. 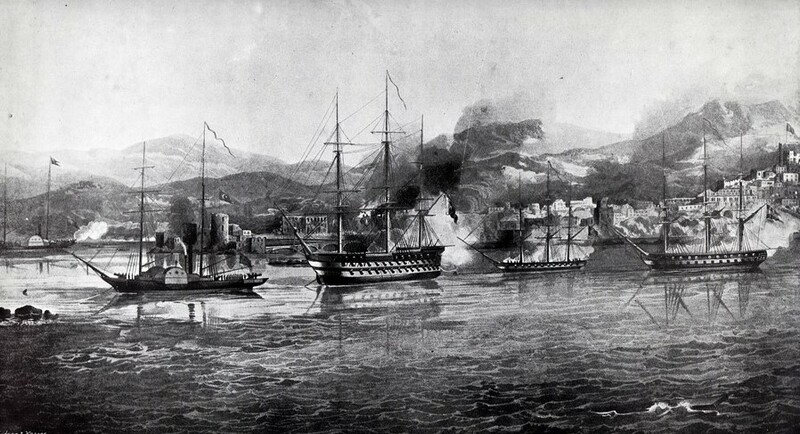 In June 1840, the entire Ottoman navy defected to Muhammed Ali and the French Government, with aspirations to regain the control of the area which Napoleon had won briefly, then lost, decided to offer full support to Muhammad Ali. This would involve an major strategic reorientation in the Middle East and indeed held the seeds of a general European conflict (WW1 seven decades too soon!). Britain, Austria, Prussia and Russia decided that preservation of the Ottoman Empire was paramount and decided to intervene jointly to prevent total collapse. By the “Convention of London”, signed in July 1840, these powers offered Muhammad Ali and his heirs permanent control over Egypt, the Sudan and the “Eyalet of Acre” (an area roughly corresponding to modern Israel, Palestine and Southern Lebanon) as nominal territories of the Ottoman Empire. Muhammad Ali hesitated, believing that he could rely on French support. This was a fatal miscalculation. 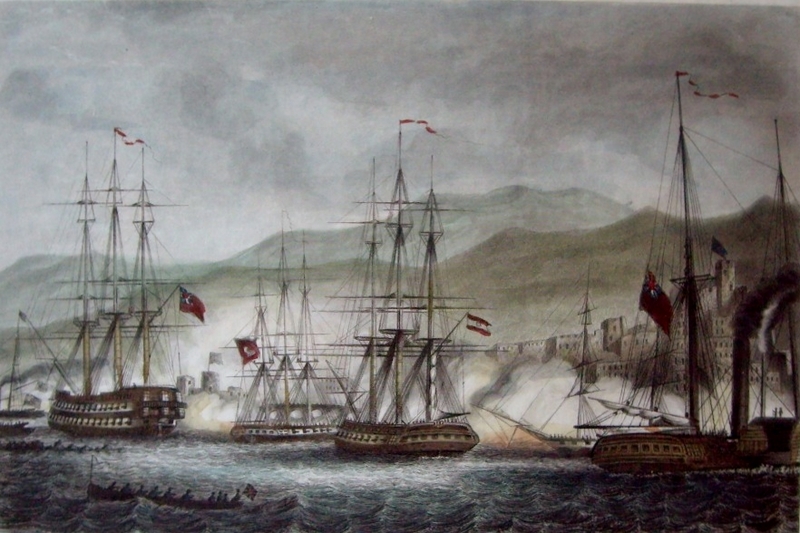 British and Austrian naval forces moved into action in September 1840. Faced with the possibility that confrontation with Britain could mean war, France, pragmatically but ingloriously, changed sides the following month, aligning itself with the other European nations against Muhammad Ali. By this time the Royal Navy and the Austrian Navy had already been in action. Alexandria, to where the defecting Ottoman fleet had withdrawn, was blockaded and forces were concentrated on Sidon and Beirut on the Lebanese coast. 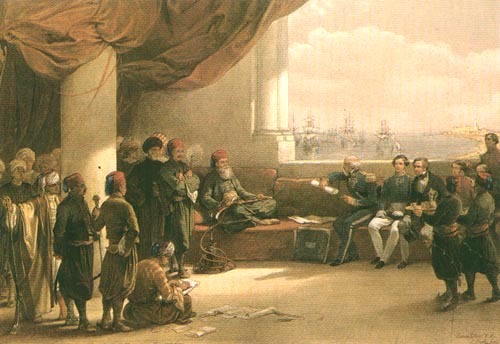 At Sidon the withdrawal of the Ottoman garrison was demanded by the British commander, Commodore Charles Napier (1786-1860). A refusal bought bombardment by Napier’s squadron on September 27th. This force was led by the HMS Thunderer, a two-deck 84-gun second rate ship of the line, launched in 1831 but not significantly different to ships of the Napoleonic era. In support was a relic of that period, the 18-gun brig sloop HMS Wasp, launched in 1812. Significantly however these two sailing vessels were supported by four steam vessels, Cyclops, Gorgon, Stromboli and Hydra. 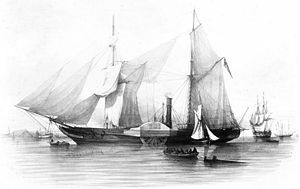 (Readers of this blog will remember meeting HMS Gorgon in a later action, at the Battle of Obligado, in 1845 – see separate article). Further support was provided by the Austrian sailing frigate Guerrierea of 48-guns and the Ottoman corvette Gulsefide. The contemporary illustration below – by A Lieutenant J.F.Warre RN (of whom I have no further details) – shows the Thunderer at the centre and the Ottoman and Austrian vessels to the right. The paddle steamers to the left could be any of the four such British vessels present. The bombardment seems to have driven the Egyptian defenders from their positions and, in the best Royal Navy tradition, a naval brigade landed under Napier’s personal command, suppressed any remaining opposition and captured many prisoners. Beirut was subjected to similar treatment but did not yield until October 9th, after Napier had again landed and had conducted a vigorous and successful land campaign. Acre (just north of Haifa) was the remaining Egyptian stronghold on the Eastern Mediterranean coast. British and Austrian forces, attacked again, led by HMS Thunderer. Following a bombardment on November 3rd 1840 a small landing party of Austrian, British and Ottoman troops, led personally by the Austrian fleet commander, Archduke Friedrich, took the citadel after the Egyptian garrison had fled. Muhammad Ali now accepted the inevitable and assented to the terms of the Convention of London on November 27th. He renounced his claims over Crete and Western Arabia and agreed to hand back the Ottoman fleet and to downsize his remaining naval forces and standing army. In return he and his descendants would enjoy hereditary rule over Egypt and Sudan. The dynasty he established was to rule Egypt – not always gloriously or successfully – until its final representative, King Farouk, was ousted in the 1952 Revolution. HMS Thunderer was to serve on towards the dawn of a new age of naval technology and 1863 was fitted with iron plates for trials of new armour-piercing guns. She survived as a storage hulk until 1901, initially renamed Comet, and subsequently Nettle, one of the last links with the age of fighting sail. 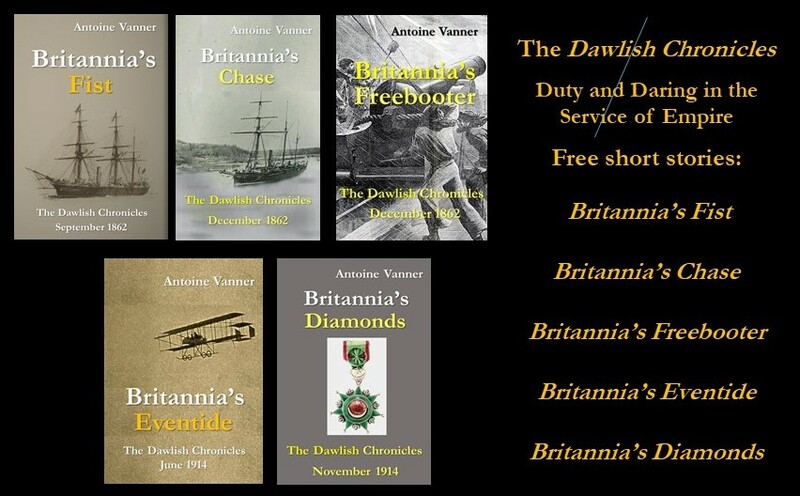 If you’re a Kindle Unlimited subscriber you can read any of the seven Dawlish Chronicles novels without further charge. They are also available for purchase on Kindle or as stylish 9 X 6 paperbacks. 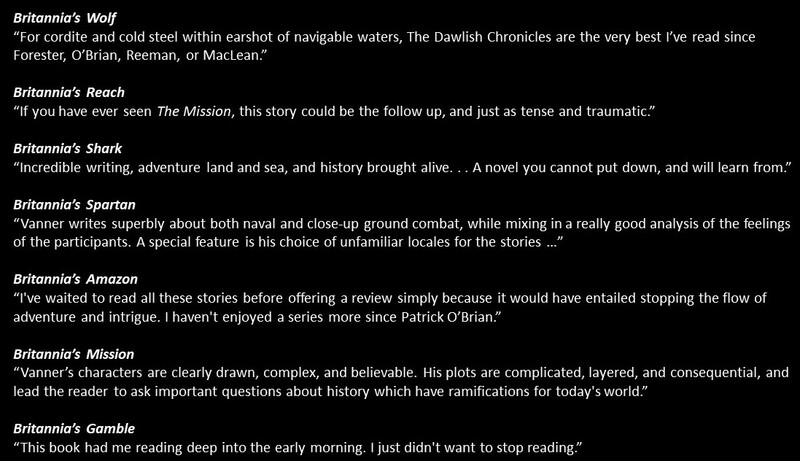 Registering for the Dawlish Chronicles mailing list, by clicking on any of the cover images below, will keep you updated on new books. You will also receive five free short stories for downloading on your computer, tablet or Kindle.